The Tank covered 5000 miles in the last three months. It is one dirty RV and I set about cleaning it yesterday. 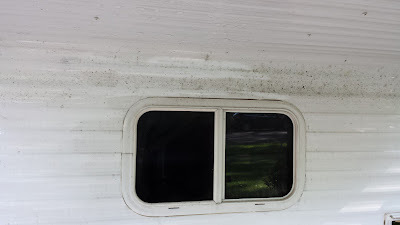 The bug marks had been weathered into the fiberglass wind screen to the point where it was necessary to use a commercial auto cleaning solution and the back of one of those "brillo" sponges, and a lot of elbow grease. Thousands of bug hits incurred over 5000 miles. 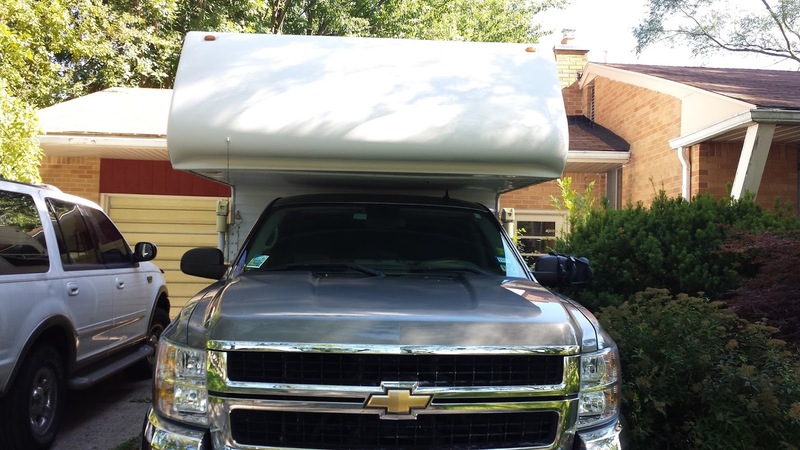 I dismounted the camper and lowered it on it's stilts so that it was accessible with a small step ladder. 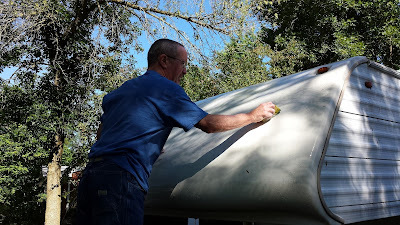 To clean the wind foil in front I backed the pickup up to the front and lowered the tailgate to use as a scaffold. First time in 3 months the Tank has been "disassembled". It was a slow process. Scrub cleaner into a section, get down hose the area off, re-scrub the areas you missed, hose it down, move to the next section. It took most of the morning but it looks 100 percent better. Sparkling! I ran the truck through a car wash too. 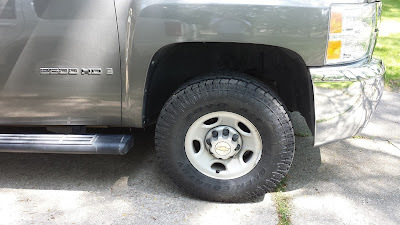 During the cleaning of the Tank my brother Jim (who is putting me up in his driveway until my Dad's 86th birthday party Saturday night) pointed out severe tread wear on one of the Tank's front tires. The kind of wear that makes one ask "How did this thing not come apart on the way down from Traverse City?" The Tank's tires have 56,000 miles on them so I bit the bullet and bought 4 10-ply heavy duty tires. The tank also needed shocks all around sooooo I walked out of the tire store $1300 lighter. Oh well, I'm going camping in the Rockies with my daughter over Labor Day so I'm real grateful we found a problem before it manifested itself on I-70 going through the Eisenhower Tunnel at 11 pm.